I have a huge treat for everyone today. 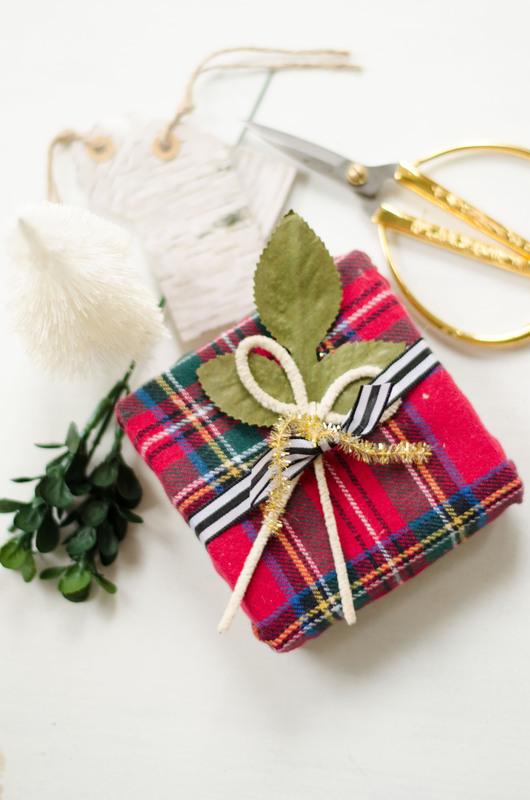 Jill, from Sew a Fine Seam is here with some beautiful gift wrapping ideas.. and instead of using paper or other more traditional methods, she is sharing some gorgeous ideas using textiles and fiber trims. 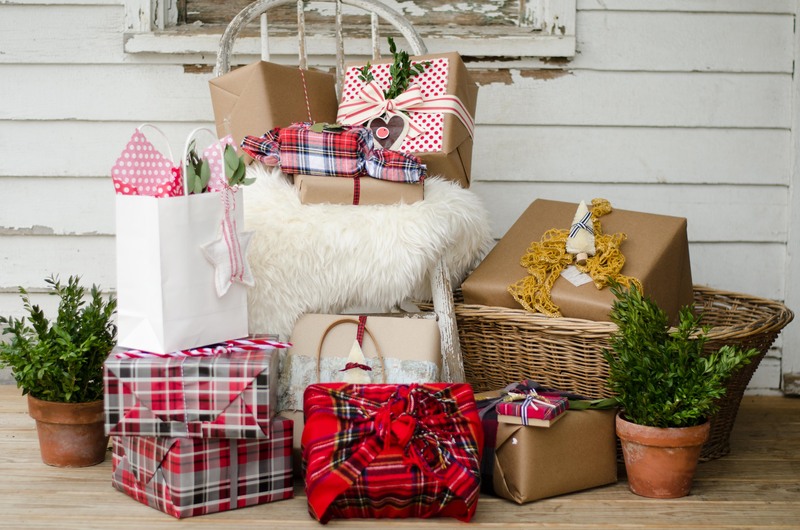 Any gift recipient would be awed by a present wrapped these fabulous materials! I am so excited to have Jill as a contributor, since I have been a fan of her blog for a long time. She has some of THE MOST beautiful photography. Seriously, just check out her holiday dining room or fall home tour. She makes me want to move in! Plus she is an amazing seamstress and crafter. This colored pencil flower ball BLEW MY MIND! I promise, you will become a fan of hers after reading a few of her posts. And if you can't wait that long, of course you can already find her on Facebook, Instagram, Twitter, and Pinterest. Hey there! Merry Christmas! Ho-Ho-Ho! I'm beside myself with excitement to be here at 'The Kim Six Fix'! I'm Jill Flory and I blog at Sew a Fine Seam. Thanks so much Kim, for the opportunity to share some fun stuff with your readers! So who's ready to wrap some gifts? This year I'm using textiles and vintage items from my stash to bling out my packages and I'm thrilled to share some of that with you. So put on some Christmas tunes, grab a mug of something hot to drink, dig through your stash of fabric (if you don't have fabric we can still be friends, and you can grab some fat quarters of fun fabrics at the store) and let's get started! I love wrapping gifts. I've been known to put more time and effort (and even money) into the wrapping of a gift than the actual gift. 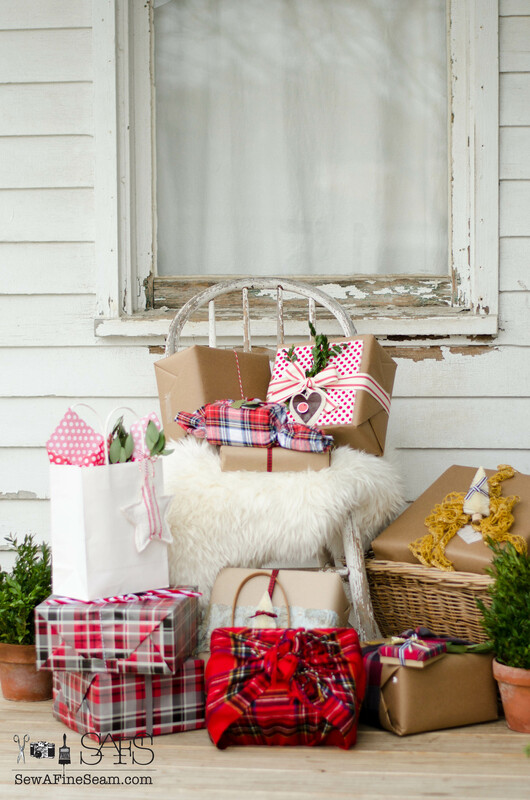 I've also been known to simply toss a gift in a gift bag and stuff some tissue paper on top when in a hurry, so it's all good - no need for anyone to feel left out if you don't bling out all your gifts! 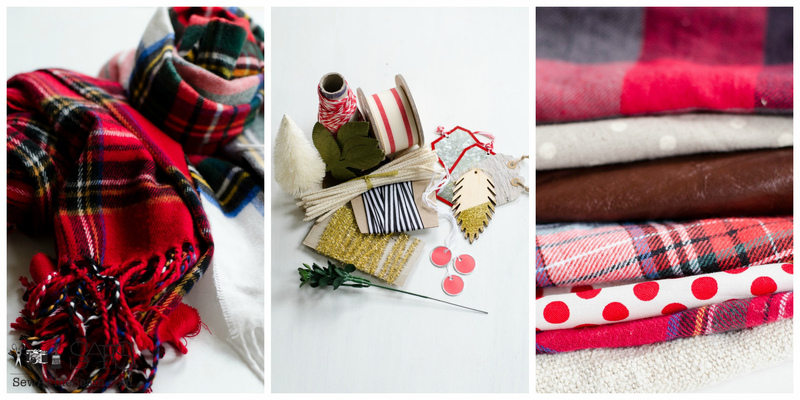 I dug through my pile of fabrics and pulled out the cheerful plaids, fun red dots, and a bit of leather. I added a couple thrifted plaid scarves to my pile and pulled out vintage ribbon, vintage faux leaves, bottle brush trees, and cute gift tags from the dollar store. The brown boxes sitting around were about to get dressed up. 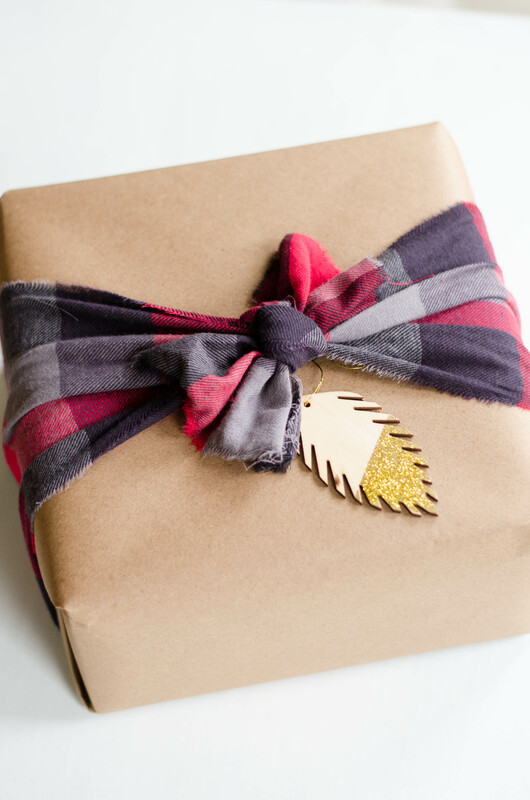 If your box is small enough for a scarf to fit around it, this is the easiest, fastest way to wrap a Christmas gift and the wrapping is indeed, part of the gift! In fact you could make it the gift and inside the box put a cute card - an inside-out sort of present! You can see in the photo above the simple steps to wrap a box with a scarf. Fold scarf ends over box. Twist scarf ends around each other and situate them to cover the two adjacent sides of the box. Arrange scarf so the box is covered completely. Flip scarf-covered-box over and bring ends together on the top of the gift. Fasten ends together with a twist-tie. I used a vintage chenille stem but you can totally go grab a twist-tie off your bread sack in the kitchen. Or a new chenille stem from your craft stash will work too. Fluff the ends of the scarf so they look cute. Bam. Done. Move on to the next gift please! I use craft paper quite often as my base for a fun gift wrap. It's a nice neutral background for whatever I want to detail the package with. Here, I tore a square (I tore it instead of cutting it so the edges would be straight and also because I like a torn, raw edge) a bit smaller than the top of the box. You could hot glue the corners on to keep it in place, or use double sided tape. I simply tied a wide ribbon around the package and it kept the fabric in place enough for me. For a gift tag, I cut a heart shape in a scrap of grain sack fabric and another heart out of a leather scrap, making the leather heart a bit smaller than the grain sack heart. I punched a hole in the hearts and added a red tag with an initial printed on it. To cut a heart, simply fold your fabric in half and cut a half a heart - unfold it and you have a perfect heart! I like to tuck some fresh greens into the ribbon on the packages too. I try to do this the day we will be going to our Christmas so it is fresh and pretty. Faux boxwood or vintage leaves work too, for detailing a gift. 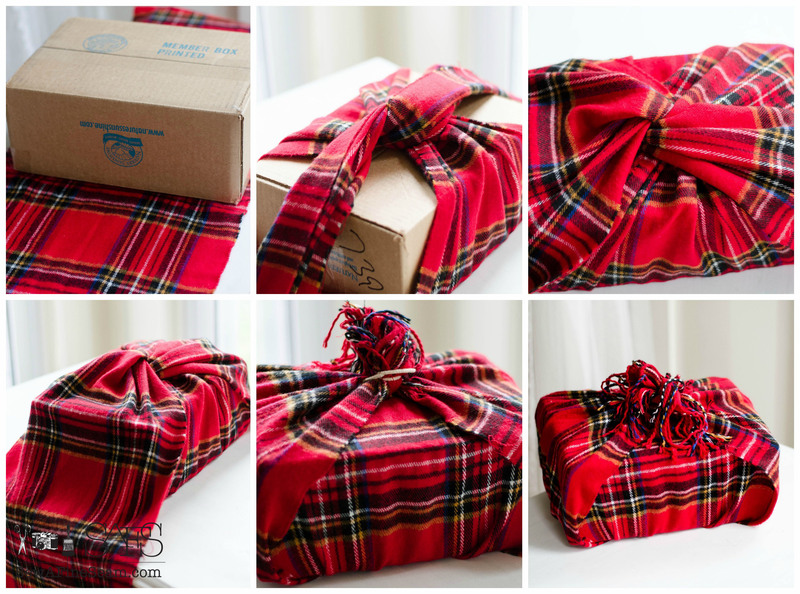 For this gift I used a small jewelry box and covered the top of the box using a scrap of plaid fabric. Cut the fabric square large enough it can wrap over the lip of the box top. Hot glue the fabric to the inside of the box. 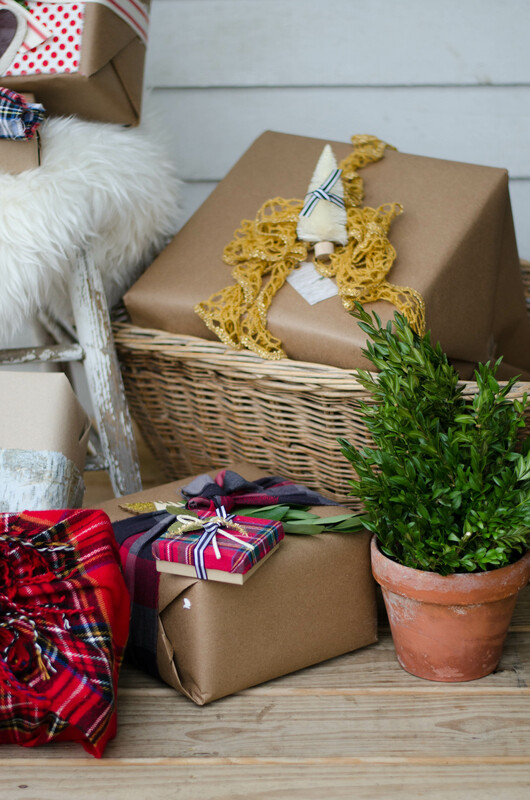 Add the lid to the box, wrap a ribbon around it and top with a vintage mix of faux greenery and a bow made from vintage chenille stems. 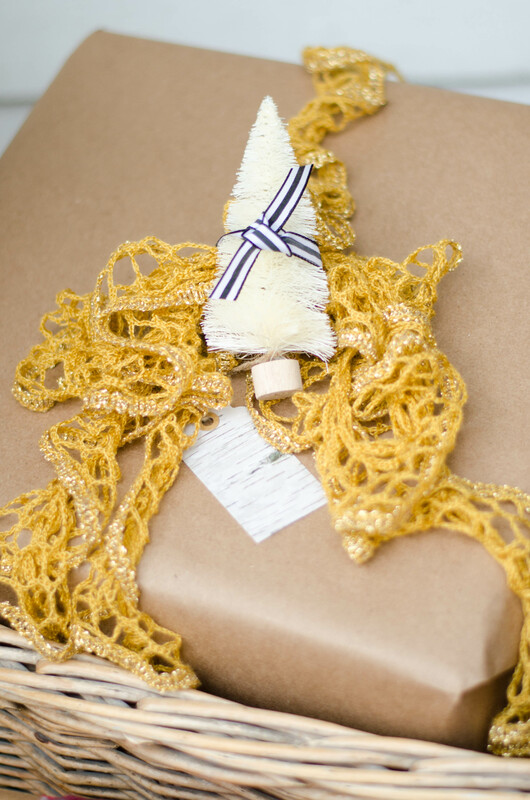 A bit of tiny, vintage tinsel ties the bow and leaf to the ribbon around the box. Another scarf, this one a crocheted one, tied around a gift in a big floppy bow. Add a bottle brush tree tied on with black and white ribbon and you have a classy looking gift. Now, pull out your needle and thread for this one! Another scrap of plaid fabric wrapped around a box and hand stitched together. Start with your knot on the underneath side where it won't show and use medium sized stitches along the length of the box. Knot it off at the end. For the tag - thread a large-eyed needle with baker's twine and sew the twine through a bit of the fabric. Tie your tag on and prepare to wow your gift recipient. Tie off the overlapping ends with heavy-weight thread. 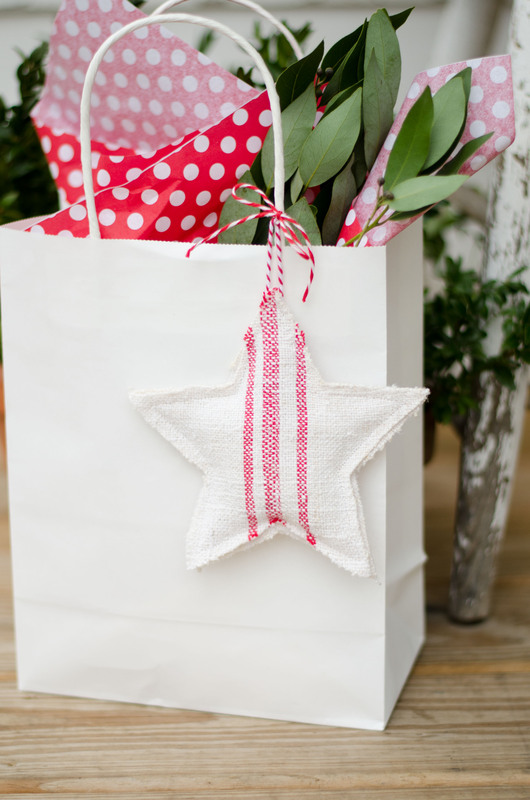 In place of a scarf, for a fun detail, you can use a long strip of fabric tied around the gift like a ribbon. 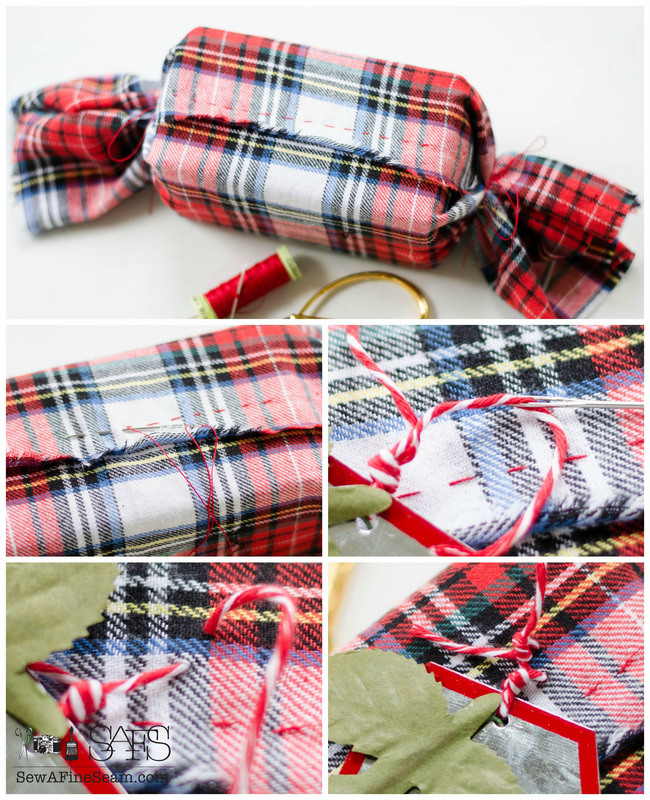 One last option - make ornaments out of textiles and tie to your gifts. Tutorial for ornaments found here. 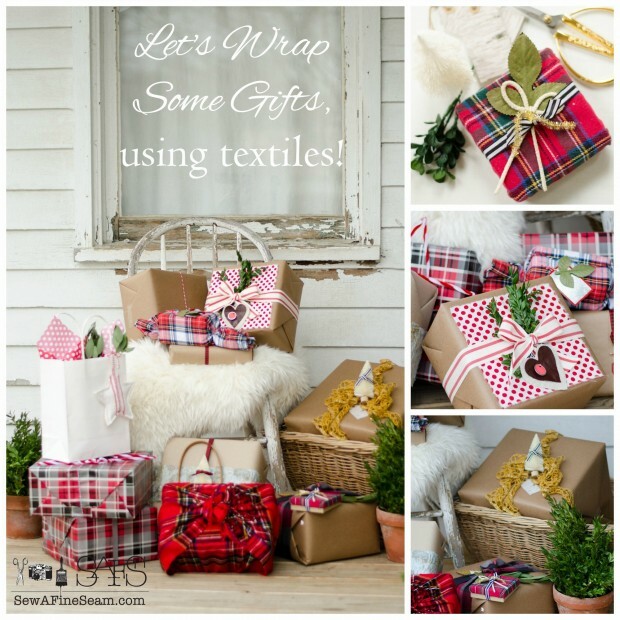 And there you have it - all kinds of ways to dress up your packages in textiles this year! Happy wrapping, happy happy Christmas to all! 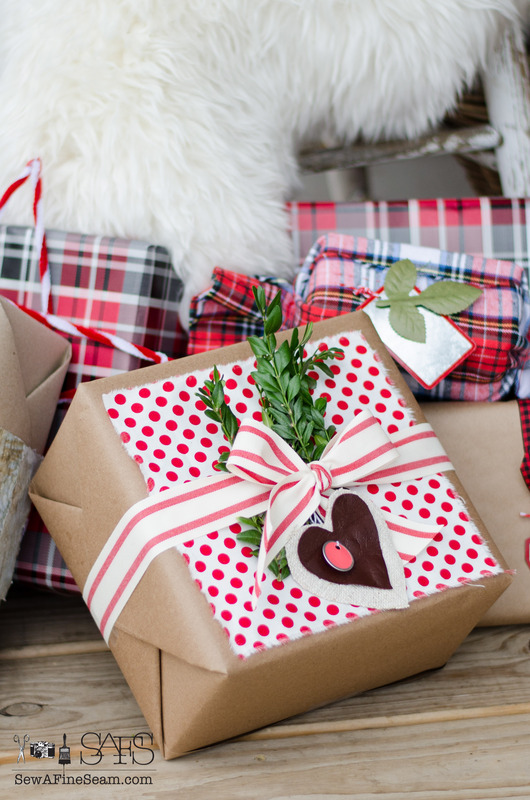 Thanks again, Kim, for letting me share my wrapping ideas!